(Basel)(PPS) More than 54,000 people who visited the exhibition Gauguin to Picasso: Masterworks from Switzerland, The Staechelin & Im Obersteg Collections at The Phillips Collection between October 10, 2015 and January 10, 2016 had the opportunity to create and share their own selfie masterpiece with Portrait Play. The Swiss company appamics had developed the Portrait Play app and beacon installation for the exhibition in partnership with The Phillips Collection, the Embassy of Switzerland, Switzerland Tourism, Basel Tourism and City Marketing. 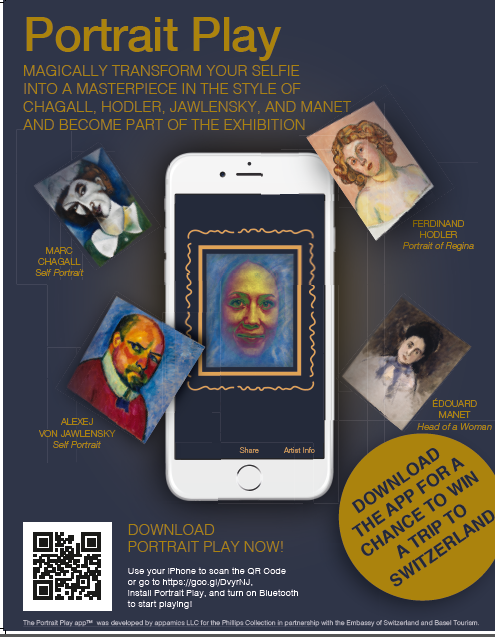 Portrait Play app magically transformed the selfies of exhibition visitors into virtual masterpieces based on the style of four world famous artists whose works were part of the exhibition: Marc Chagall, Ferdinand Hodler, Alexej von Jawlensky and Édouard Manet. Visitors experienced how their selfie morphed into different artistic styles and became part of the exhibition on a large screen in the museum’s Swiss Lounge. The Phillips Collection is among a group of forward-thinking museums that are creating the museum of the future by using technology to offer visitors unique ways to experience their exhibitions. ”Switzerland not only boasts an impressive number of world-class museums and art galleries and public and private art and design collections, it is also an impressive hub of cultural creation and innovation, with many remarkable contemporary artists, designers and architects. It is home to no less than six major art schools and to the world’s largest art fair, Art Basel. Switzerland’s increasingly recognized prominence in the arts is built on the very same foundations that have made our country a leader in innovation, a center for international dialogue, and a hub for business and finance, namely, its political and economic stability, vibrant society, cultural diversity and position in the heart of Europe. Those are values we share with the United States, which is the reason for the strong bonds between our nations and our excellent relations,” commented Martin Dahinden, Ambassador of Switzerland to the United States of America. In addition to the interactive experience at the exhibition, the app provided in-depth information on the artists, the paintings and the era of their creation. The app also provided information on Switzerland and the city of Basel as a thriving hub for art where both art collections shown at the exhibit are based. App users had the chance to win a trip to Switzerland, sponsored by Swiss Tourism, to experience Swiss art and culture up-close. Appamics programmed the app and interaction with the museum visitors by installing tiny beacons from Swiss based manufacturer EM Microelectronic in the museum. Appamics empowers organizations across industries to engage consumers with innovative digital technology. The company offers smart applications and services for all types of screen environments, from TVs, tablets, smartphones and desktop environments. Its applications and services help clients to bridge the gap between multiple screens and bring the promise of the Internet of Things to life. Areas of expertise include IPTV, OTT, beacon ecosystems, second screen apps, multi-screen apps, and cloud services (PaaS, SaaS). The company was founded in 2012 and is headquartered in Basel, Switzerland. For more information, go to www.appamics.com, or contact us at marketing@appamics.com. The Phillips Collection, America’s first museum of Modern art, is one of the world’s most distinguished collections of Impressionist and Modern American and European art. Stressing the continuity between art of the past and present, it offers a strikingly original and experimental approach to Modern art by combining works of different nationalities and periods in displays that change frequently. The setting is similarly unconventional, featuring small rooms, a domestic scale, and a personal atmosphere. Artists represented in the collection include Pierre-Auguste Renoir, Vincent van Gogh, Edgar Degas, Henri Matisse, Pierre Bonnard, Paul Cézanne, Pablo Picasso, Paul Klee, Claude Monet, Honoré Daumier, Georgia O’Keeffe, Arthur Dove, Mark Rothko, Milton Avery, Jacob Lawrence, and Richard Diebenkorn, among others. The permanent collection has grown to include more than 1,000 photographs, many by American photographers Berenice Abbott, Esther Bubley, and Bruce Davidson, and works by contemporary artists such as Anslem Kiefer, Wolfgang Laib, Whitfield Lovell, and Leo Villareal. The Phillips Collection regularly organizes acclaimed special exhibitions, many of which travel internationally. The Intersections series features projects by contemporary artists responding to art and spaces in the museum. The Phillips also produces award-winning education programs for K–12 teachers and students, as well as for adults. The University of Maryland Center for Art and Knowledge at The Phillips Collection is the museum’s nexus for academic work, scholarly exchange, and interdisciplinary collaborations. Since 1941, the museum has hosted Sunday Concerts in its wood-paneled Music Room. The Phillips Collection is a private, non-government museum, supported primarily by donations. As the official representation of Switzerland, the Embassy covers all matters concerning diplomatic relations between the two countries. It represents Swiss interests in the areas of political, economic, financial and legal affairs, as well as science, education and culture. The Embassy reaches out to a wide range of audiences far beyond governmental decision-makers. These audiences include individuals and representatives of public and private institutions in fields such as academia, advocacy, the arts, business, culture, development, education, human rights, international cooperation, the media, or science. A sustained dialogue with a broad array of stakeholders on topics of common interest and concern is an essential part of Swiss diplomacy worldwide. Through the organization of and participation in public events on a variety of themes, the Embassy contributes to a better understanding of Switzerland’s less known but nonetheless remarkable and often unique characteristics, including the country’s political institutions with unparalleled citizens’ participation its unsurpassed economic competitiveness, but also its great cultural diversity and remarkable artistic, scientific and technological achievements. More importantly, it provides opportunities for Swiss and U.S. audiences to learn from each other’s experiences and explore new possibilities of cooperation between both countries. Basel Tourism was founded with the primary goal of safeguarding and benefiting the health of the city and surrounding region. As an association under civil law, it works closely with the authorities in order to promote and protect the catering and hotel industries and other interested parties associated with the tourism industry in Basel and the surrounding area. The main focus is on promoting Basel as a brand in Switzerland and abroad, the creation of offers and services for tourists and business travellers, the imparting of information and mediation services by telephone, e-mail or at the information counter, the opening of our distribution channels to our partners and the general representation of the interests of tourists.